Since the decline in fertility as a woman passes into each decade of life is strictly related to the aging of her ovaries (and consequently her eggs), considerable effort has been made in the past to try to develop tests to determine ovarian reserve. “Ovarian reserve” simply means the number of eggs your ovary has in reserve. The greater your ovarian reserve, the more time is left on your biological clock. In the past, tests to measure ovarian reserve were not really useful. These included day three FSH and estradiol, day three inhibin, the Clomid challenge test, and even ultrasound evaluation of ovarian size. None of these tests were predictive at all. FIGURE 2: Hormonal Control of a normal menstrual cycle. None of the previously described tests achieve the accuracy, simplicity, and reproducibility that we have found with ultrasound-performed antral follicle counts [see video] for ascertaining where you are on your biological calendar. The ultrasound determination of antral follicle count is the same at any time during the cycle, is independent of birth control pill usage or other hormone administration, and is very easy to have performed by any radiology center or gynecologist with a relatively modern ultrasound machine. The best preparation for this test is to have a very good understanding of just how your ovary works, how your eggs are formed, how they die and diminish over your reproductive life span, and just what it is that the radiologist, or the technician, or the gynecologist, will be looking at when he or she performs, during a routine ultrasound examination, your antral follicle count. The procedure is extraordinarily simple for any doctor or technician to perform, but only if they are aware of its significance — most are not. 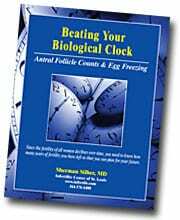 Any woman can obtain an easy estimate of when she should or should not begin to be concerned about her biological clock. A new (and expensive) blood test, called “antimullerian” hormone, or AMH level, also measures antral follicle count, but in a different way than simple ultrasound.